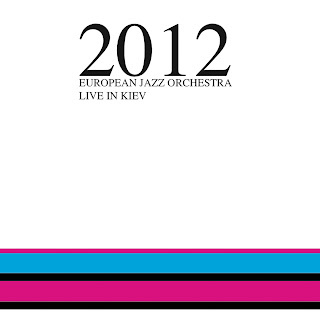 I’m a board-member of DSI Swinging Europe, the cultural institution behind European Jazz Orchestra. So I guess it would be a little weird if I wrote a review of this CD. I would like to comment on it, though. It is the jazz-producer-group from European Broadcasting Union who is responsible for the artistic side of the orchestra. They chose the Ukrainian composer and conductor, Igor Stetsyuk, to be in charge of the music in 2012. This meant that Ukraine was the last country on the tour which went through nine different countries with start in Denmark. 19 musicians from 16 different countries were in the line-up. Before the tour was a reality there were some challenges to be solved. Stetsyuk wanted a string-group of more than 30 people to be added to the orchestra. This was not possible, financially, but the composer had arranged for a load of strings to be ready when the orchestra reached Kiev and it is the material from those concerts that you find on the album. Igor Stetsyuk is not Mr. Anybody in Ukrainian music. Among many other things he has written the score for more than 40 movies. The music on this album is a step back in time. It’s from when Ukraine was a part of the Soviet Union. But the style of music doesn’t tell. The music is western with elements of jazz, funk, pop and symphonic music melting together in a sound from the 70ies and 80ies. Some material sounds as if we have ended up in a cartoon from Disney. You find music by Sting (a splendid instrumental of La Belle Dame sans Regret) and Average White Band (the super classic Pick up the Pieces). Stetsyuk is very sharp as arranger and he knows how to control a large orchestra. He knows what he wants. On the other hand it narrows down the space left for the soloists. The big band does have some strong musicians who will do very well on the European stages in the years to come. The singer Kadri Voorand from Estonia, whom you normally find on the more experimental side of jazz, proves her ability to sing with a big band. I come to think of DR Big Band in the 80ies and a singer as fine as Hanne Boel. Well, it might be a little old-fashioned but on the other hand jazz is showing that it is a language which can be spoken across the European borders – even as far away as Kiev. Bonus-info: Composer and conductor in 2013 is Ann-Sofi Söderqvist from Sweden. Comments: Niels Overgård. Translation: DSI Swinging Europe.